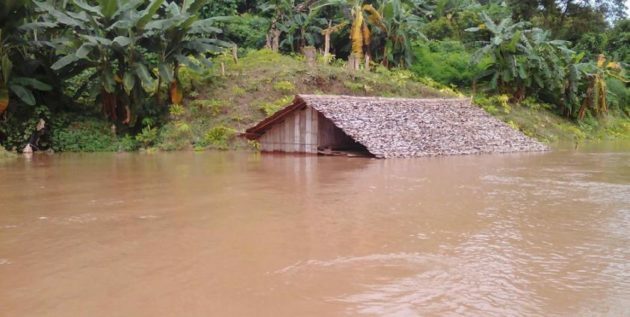 Some homes have been inundated and some local residents were forced to flee to safe ground in Ei Tu Hta Internally Displaced Person (IDP) camp due to sudden rise of the Salween River on September 5, the camp’s social affairs coordinator Saw Paul Leh Kar Li Lar Mu said to Karen News. Ei Tu Hta IDP camp is located besides the Salween River at the Thai-Burma border within Mu Traw (Hpapun) District in the northern Karen State. Fifteen homes have been inundated and 13 homes are in serious condition after the camp became flooded. The flood-affected residents are taking shelter in nearby homes and the water level still has not receded and toilets are included among the inundated buildings so the residents need emergency medicine for their health. The local residents are also feeling concerned over continuous rise of the floodwater. The Ei Tu Hta IDP camp was opened as a temporary shelter for the Karen people fleeing from the fighting between the Tatmadaw and the Karen National Union (KNU) in the KNU Brigade 2 area in 2006. Over 2,000 people are currently living at the camp. Although Ei Tu Hta camp was flooded nearly every year in the past due to the rise of the Salween River, the situation was not serious like the recent flooding, the camp’s officials said.